Phlebotomists are technicians tasked with drawing blood from patients and donors for research, treatment, and testing. They also explain procedures to patients, provide aftercare, label and process samples, and direct samples to appropriate departments for testing. 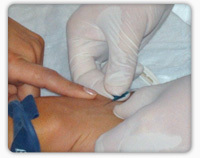 Phlebotomists may also be considered technologists if they supervise technicians and perform tests on samples. With greater responsibilities and specialized skills and knowledge, phlebotomists' earning potential also increases. Phlebotomy technicians and technologists can enhance their earning potential by obtaining certain qualifications, such as certification and specialized training. Obtaining a postsecondary certificate in phlebotomy and passing a certifying exam will also increase your chances of employment since many employers prefer to hire phlebotomists with formal training and certification. Education and training programs are available at hospitals, trade and technical schools, community colleges, and junior colleges. Whether you are a phlebotomy technician or technologist, many employers look for phlebotomists with certification. Certification provides reassurance a prospective employee that you meet minimum standards in the skills necessary to safely and effectively perform your duties. It also demonstrates that you are committed to your career and ongoing professional development. Phlebotomy technicians can also be certified in specialities in phlebotomy, such as donor phlebotomy. Certification is offered by professional associations, such as the American Society of Clinical Pathologists and the American Society of Phlebotomy Technicians.